FILE - The U.S. Navy guided-missile destroyer USS John S. McCain is seen after a collision, in Singapore waters, Aug. 21, 2017. After a pair of crashes involving U.S. Navy ships in the Asia-Pacific killed more than a dozen people last year, the Navy's efforts to develop its leaders is receiving renewed attention. 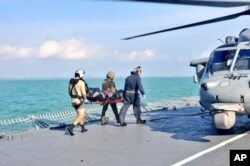 FILE - Royal Malaysian Navy personnel carry a body onto a U.S. Navy helicopter from USS America during a search and rescue operation for survivors of the USS John S. McCain. Some observers, including lawmakers during a congressional hearing, have been critical of the Navy's handling of the incidents. "As we've come through the collisions, the investigations focused on the accountability and in some cases discipline; it has just become clear that you can't emphasize and focus on it too much," Richardson told a small group of reporters. "One [issue] that has perhaps not been given the attention that is required, [and] we're starting to understand that its required on a more continuous basis, is this idea of character competency," — or leadership development, Harley said. "The Navy really kind of has unique and specific roles in making all that happen, not only from a security standpoint, but also sea lanes, keeping access to markets open," Richardson said.